ANKARA, Turkey, May 25, 2018 /PRNewswire/ — XCMG, the world’s leading construction machinery manufacturer, has established a new overseas company, XCMG Turkey Co., Ltd. and Spare Parts Center (XCMG Turkey), in Ankara, Turkey, which will allow the company to provide products and services to customers in the rapidly-growing country. XCMG Turkey will work with local dealers to provide a complete one-stop experience for local customers, promoting sustainable development of the XCMG brand locally and laying a solid foundation for expanding into surrounding markets. At the company’s opening ceremony, XCMG signed a US$7 million deal with a Turkish dealer, a milestone cooperation covering a variety of equipment including excavators, cranes and loaders. 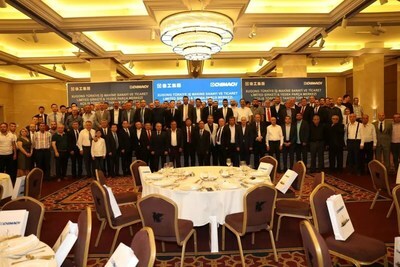 Merih Özgen, President of the Turkey Construction Machinery Association, believes that the establishment of XCMG Turkey has epoch-marking significance to the development of Turkey’s engineering machinery industry and will accelerate the development of Turkish infrastructure construction. “The ancient Silk Road started in China and ended in Turkey. The Belt and Road tightens the relationship between China and Turkey,” he said. XCMG entered the Turkish market in 2000 and the brand’s advanced and endurable products including cranes, excavators, loaders, land levelers, rotary drilling rigs and more have been used by many construction projects in the country. At present, more than 1,000 XCMG machineries are working in the Turkey. XCMG has expanded its market share in the 57 countries participating in China’s “Belt and Road” Initiative, with exports to those countries accounting for 72 percent of the company’s total outbound volume. Just in April, XCMG delivered concrete mixing plants to assist the new capital project in Egypt.